Michael, which is now a tropical storm, will exit off the East Coast Thursday, on its way across the North Atlantic. Off the west coast of Mexico, Tropical Storm Sergio will move in Thursday night, and is forecast to bring heavy tropical rain across parts of Texas, Oklahoma and points east this weekend. 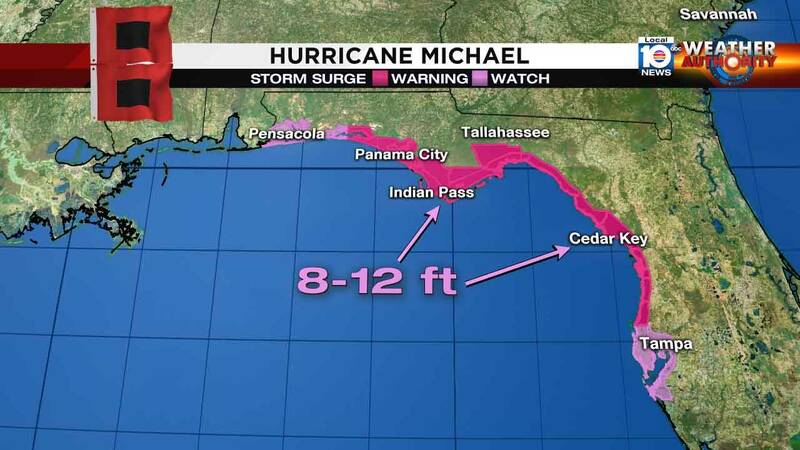 The National Hurricane Center said Michael made landfall near Mexico Beach at 1 p.m. Wednesday with top winds at 155 mph. Gadsden County officials said a man died after a tree fell on his home in Greensboro. Brooks said responding crews reached the home after nightfall due to downed power lines, poles and trees. Meanwhile, the Florida Highway Patrol announced it has closed an 80-mile stretch of Interstate 10 to clear debris from Michael. Experts said Michael was the most powerful hurricane to hit the continental U.S. in nearly 50 years. Video taken by residents and journalists in the area show building damage and heavy flooding. 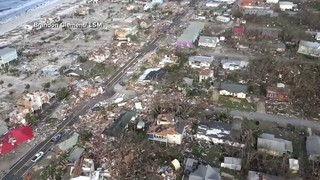 One video showed storm surge in the Mexico Beach area reaching the roofs of homes. As Michael made landfall, hurricane force winds extended more than 100 miles inland. Tropical Storm Michael is moving quickly across the Carolinas Thursday with heavy rain and winds gusting to 50 mph or more. Flash flooding and downed trees and power lines are still possible until it exits the East Coast Thursday night. Michael combined with an approaching cold front is producing a solid area of rain affecting the Carolinas, the North Atlantic states and the Northeast. 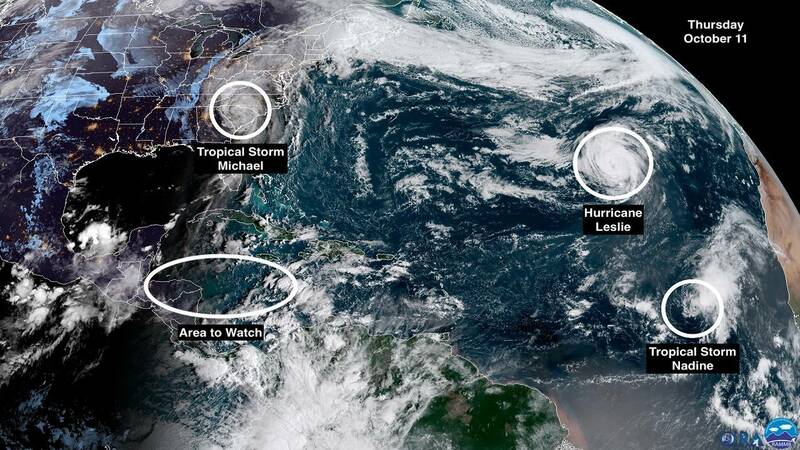 The National Hurricane Center said the core of Michael will move across portions of central and eastern North Carolina and southeastern Virginia into the Atlantic Ocean by late Thursday or early Friday. Before the storm hit, Florida Gov. Rick Scott said the impact of Michael would be "horrible," the worst storm to hit the Panhandle in a century. Evacuation orders were sent by state and local officials to about 325,000 people. Emergency managers said they don't know how many left the area, but there were about 6,000 people in 80 shelters in five states, including nearly 1,200 who are still in shelters following Hurricane Florence. Brad Kieserman is the Vice President of Operations and Logistics for the American Red Cross. He said the storm "intensified extremely quickly and didn't give anyone enough time to do much." The governor said state authorities are now focusing on the recovery effort after the fast-moving storm blew through. He has activated up 3,500 members of the Florida National Guard and said thousands of utility workers are on stand-by. National Hurricane Center Director Ken Graham had warned that Michael would bring catastrophic damage to the state. Graham said Michael's top winds were powerful enough to peel off roofs and cause the "complete destruction of houses." Stretches of the coast could have seen storm surge of at least 6 feet, with waters rising in some places up to 14 feet above the ground. Graham wants people to think about how tall they are, and just how high that water can be. Graham said falling trees will pull down utility lines, leaving some areas without power for weeks, and hazardous conditions will persist long after the storm blows through. He said the aftermath of a hurricane is "not the time to start learning to use that chain saw." On Panama City Beach and west to about Destin, Gulf water 6-9 feet above the normal high-tide level pushed in. The wind was strong enough to challenge even the strongest building in the corridor of strongest winds. Interior hallways, small bathrooms, closets and under stairwells are normally the safest places in homes. Stairwells and interior hallways on low floors, but above the water, are normally safest in high rises. Elsewhere in the tropics, Tropical Storm Sergio is forecast to come ashore in Baja California on Mexico’s northern Pacific coast Thursday. The storm will die out, but heavy tropical rain with spread from New Mexico, through west Texas, Oklahoma and the southern Plains this weekend. Hurricane Leslie is still chugging along in the eastern Atlantic. It is now forecast to threaten the Canary Islands off the northwest corner of Africa in a few days as a weaker storm. Tropical Storm Nadine is forecast to die out in a couple days in the eastern Atlantic. The area to watch hasn't yet developed, but may try to organize over the weekend in the western Caribbean Sea. It does not appear to be a threat to the U.S., even if it does develop, but would more likely move into Central America.